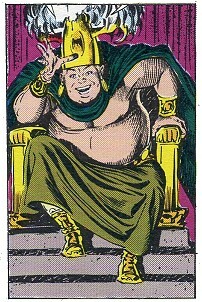 Powers/Abilities: Akkheba's magic powers seemed very limited. As with the other Kelkan priests, his sorcerous ways were used to prevent Astarta's voice from reaching the sea. His power was mainly religious-political, as he would sacrifice people for his rites. (Conan the Barbarian I#71 (fb) - BTS) - Akkheba was a priest of the bloody cult of Ashtoreth. Just like his predecessors, Akkheba held power over the Kelkans using Ashtoreth to deceive them. He knew that Ashtoreth was actually an immortal woman named Astarta, but who was without divine powers. So Astarta was kept in a tower, seen only by priests, and sometimes menaced or tortured. Akkheba also cast a spell to block Astarta's voice so that it couldn't reach the Sea to call her love, the destructive Sea-God. 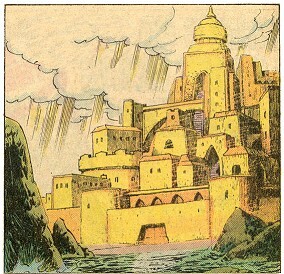 (Conan the Barbarian I#70 (fb) - BTS) - Once per year, the Island of Kelka was assaulted by Barachan pirates led by Auro. Akkheba and the rest of Kelka paid tributes to the pirates so that their lives would be spared. (Conan the Barbarian I#70) - One day, Conan, Bêlit and her corsairs reached Kelka, and defeated some savage Kelkans in battle. Akkheba promised Conan and Bêlit gold and food if they would help Kelka defeat Auro. Aluna, a handmaiden, along with others of her station, welcomed the strangers. Some days after, Auro and his Argossean crew arrived from the sea, asking for their tribute. The superior forces of the Barachans, however, were taken by surprise by the corsairs, and Auro fled before his forces could be annihilated. Akkheba was nevertheless happy and invited his allies to the feast that night. But Akkheba had the wine drugged so that all the corsairs fell asleep defenseless, and were made ready to be sacrificed to Ashtoreth the day after. (Conan the Barbarian I#71) - Akkheba was so happy about the victory that he decided to bring the sacrifices forward that night. Several of his men were advised of this, including Wharto. In the tower of Ashtoreth, Aluna's heart was torn out from her chest by Akkheba's knife. Blood was still dripping from the blade when Akkheba spotted Conan and Bêlit, who had freed themselves. They had escaped from the prison and were looking for revenge and booty. Akkheba managed to leave them behind and called some of his savage underlings for help. At that moment, Auro and his Barachans, helped by Kawaku, broke into the town. Akkheba fled, his warriors slain by Conan, but his fat body made him slow, and Bêlit's spear found her revenge. With his death, Akkheba's enchantment fell. Astarta could call her husband, and the Sea-God submerged Kelka and its towers. I don't remember if Auro appeared in other stories. If so, he ought to deserve his own profile. or any other "Akk-" characters or those with a similar name. or any other "Aur-" characters. Kelka was an island very far from the Hyborian coasts, far from the shipping lanes. In the Thurian Era, Kelka was civilized by men coming from the Thurian continent. They worshiped Ashtoreth and built a beautiful city in stone with high walls and towers. After the Great Cataclysm, the Sea-God brought Astarta to Kelka, a beautiful girl he had imbued with immortal life. The priests believed her to be Ashtoreth and the people, too. But the priests thought that there would be little need of them if the goddess herself was among them, and so they sought to consolidate their power. However, they were too afraid to kill her and so imprisoned her with stone and magic. In the following millennia, the Kelkan population changed. The priests kept, or tried to keep, a pure blood line, while the people became more savage, almost apish. Their blood became mixed, as ships arrived to Kelka, their crews killed or sacrificed to the cult of Ashtoreth, while the most beautiful girls were used as handmaidens or priestesses. The isolation of Kelka did not save the people from occasional attacks from pirates and corsairs. 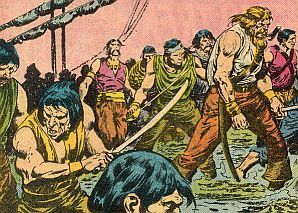 In the days of Conan, the most feared of them was Auro, a Barachan pirate. His ship visited Kelka regularly, once a year, to collect ransom for their tranquilly. When Conan and Bêlit arrived on the island, and the last priest, Akkheba, was killed by Bêlit, Astarta was freed. The Sea-God, Astarta's husband, submerged the whole island with his fury. Aluna was a beautiful Hyborian girl with milky white skin and hair like gold. She was a priestess of Ashtoreth. Aluna, as with many other girls on Kelka, had probably been shipwrecked years before as a child. Many years had passed since her arrival so that she did not speak the Black Coast language well anymore. Aluna was raised in fear of the bloody goddess Ashtoreth, whose tower held the goddess far from the eyes of the people. In her life, Aluna had never actually seen Ashtoreth. She was used by Akkheba to welcome the "heroes" who liberated Kelka from Auro and his Barachans. Unfortunately, Akkheba didn't care about her, and sacrificed her the same night of the victory over the pirates and the betrayal of the corsairs. Wharto was a typical Kelkan. A normal human, a little apish, with long untidy hair and beard. Some Kelkans still walked semi-erect, but Wharto seemed a little more intelligent. He was probably one of Akkheba's men, because he knew that the beautiful Aluna had to be sacrificed to the goddess Ashtoreth. He confidentially confessed the news to one of the tavern girls during the feast after the victory over Auro. Auro was the captain of a Barachan pirate ship: the Petrel. He was ruthless and bloodthirsty. His crew was comprised of men from various nations, but mostly Argosseans. Auro had made a pact with the Kelkans. He didn't destroy their town, but they had to pay for his "protection". So, once a year, the Petrel reached Kelka for the crew to take the loot. But one time they were taken by surprise. The Kelkans had hired Bêlit and her corsairs, and Auro had to flee before his forces could be defeated. However, he did not give up the promised booty. Instead, he hid his ship in the far side of the isle, waiting for the right moment to go back. He was found by Kawaku, one of Bêlit's corsairs, who allied with him and told him about a secret passage to get into the city, the same passage that had enabled Conan, Bêlit and her corsairs to escape from Akkheba's prison. So, Auro and several Barachans walked through the dungeon and found the prison unmanned, and let in the other pirates. Their attack distracted the Kelkan guards, but just moments before, Akkheba had been killed by Bêlit and Astarta's call had reached the Sea-God Lord. When the sea started destroying the city walls, Auro ordered that they flee back to the ship.